I would like to learn some useful keyboard shortcuts. I have become a ninja of keyboard shortcuts in Windows. Any must-have tips for Ubuntu? Feel free to include Ubuntu defaults or custom ones you have found useful! You can set up whatever keyboard shortcuts you want through System -> Preferences -> Keyboard Shortcuts. This will also tell you the current shortcuts. Personally, I activate Ctrl+Alt+Backspace to restart the x server, use Ctrl+Alt+T to open a terminal, Ctrl+Alt+X as the xkill command so I can click on non-responding window to kill it and Ctrl+Alt+Delete to open the system monitor (a la Windows) instead of bringing up the shutdown prompt. There is also a whole load of keyboard shortcuts set by compiz, which can be edited using compizconfig-settings-manager1 (installable from repositories). I find keyboard shortcuts to be a personal preference and we are lucky that Linux is so customisable as to allow whatever configuration we want. There's a fairly substantial list on the Ubuntu community wiki. When I found out about Alt + Mouse 1 on an open Window. I went nuts moving windows is easy now. I also use Ctrl + Alt + (Left|Right) for switching workspaces. Lastly I find myself using Super + Space which is the default binding for Gnome Do which I love. Alt + F2 is very handy for starting programs, it has auto-completion and prevents you from clicking though the menus. In Nautilus, you can have an extra pane by pressing F3. You get a Norton Commander kind of look. ctrl+alt+l(lock) to lock your desktop. ALT + F1 : launch applications menu, probably the most used keyword combination in my laptop. ALT + Home : Jump to home folder. ALT + Enter : Show file/folder properties. ALT + F2 : Launch "run application" dialog box. ALT + F4 : Close Window. ALT + Left/Right : Go back/forward while navigation directories in nautilus. ALT + Up/Down : Go up/down while navigating directories in nautilus. ALT + Tab : Browse through windows. Shift + Del : Permanently delete files, no backing up in trash folder. F3 : Enable split view in nautilus. F8 : Show/hide nautilus menubar. F9 : Toggle nautilus side-pane. Super + Tab : "Shift switcher", need to enable it in CCSM. Super + M : Inverts all the colors. Super + A or W : Arrange windows in a nice panel like appearance(Need Compiz). CTRL + L : View/Edit full location path. CTRL + A : Select all. CTRL + N : New window. CTRL + Shift + N : New folder. CTRL + H : Show/hide hidden files. CTRL + ALT + L : Lock Screen. If your system has become complete unresponsive to where even hitting CTRL+ALT+F1 doesn't give you a terminal, it is possible to still gracefully stop your machine and reboot. Ctrl+R: Search incrementally backwards through command history. Ctrl+T: Exchange characters under and behind the cursor. Alt+. : Insert last argument from previous command. Ctrl+Arrow Left: Move to the start of the previous string (for long commands). Ctrl+Arrow Right: Move to the next non-alphabet character (eg, '/', '. ', '_', '-', etc). Arrow Up or Arrow Down: Scroll through history of commands. I like using Ctrl + arrow keys to switch workspaces. I do it a lot. It's fun. I use Ctrl + Alt + arrow keys to move windows. Super-T to open the terminal. I took a note from the guy above, and made an xkill shortcut--I use Ctrl + Alt + X.
Alt + Tab is handy as always, but less so, as I just put things on different desktops. As noted above, using compiz config is wise. Anyway, there's a reason you're able to customize them all. Get a feel for what you need to do, and how you want to do it. Come on, man, you're using Ubuntu. Go nuts. ctrl-alt-d is useful for quickly minimizing/restoring all the applications on the desktop. Alt + F7 Move windows without using the mouse. Alt + F8 Resize window without using the mouse. Alt + F9 Minimizes the focused window. Alt + F10 Toggles maximize. These might not be a shortcuts but they do involve using the keyboard: turn on Mouse Keys in Keyboard Preferences and by pressing Fn + [keys that have the same colour as the "Fn" label] you can control the pointer and simulate clicks and click-holds. Keynav is a program in the repositories that is used to control the pointer by using the keyboard to divide a window in half continually. Thus one can click a link with no more than 10 key presses (in the rare case that Vimium/Pentadactyl/Vimperator can't do the job). Long winded it is, but I haven't touched a mouse or trackpad in ages! Only vaguely on-topic, but I like rebinding the Caps Lock key to the Compose Key. Preferences > Keyboard > Layouts > Options > Compose Key Position, set to caps lock. Try it! Done? Now press Caps Lock, then apostrophe, then e. Voila, e with an accent. If you haven't looked through the emacs tutorial yet, you might want to. It's got a bunch of keyboard shortcuts that apply to the bash prompt and throughout linux in general. Alt+F1 to pop up a main menu at your mouse pointers position. Not the answer you're looking for? Browse other questions tagged keyboard shortcut-keys or ask your own question. Is there a keyboard-centric desktop/WM available? 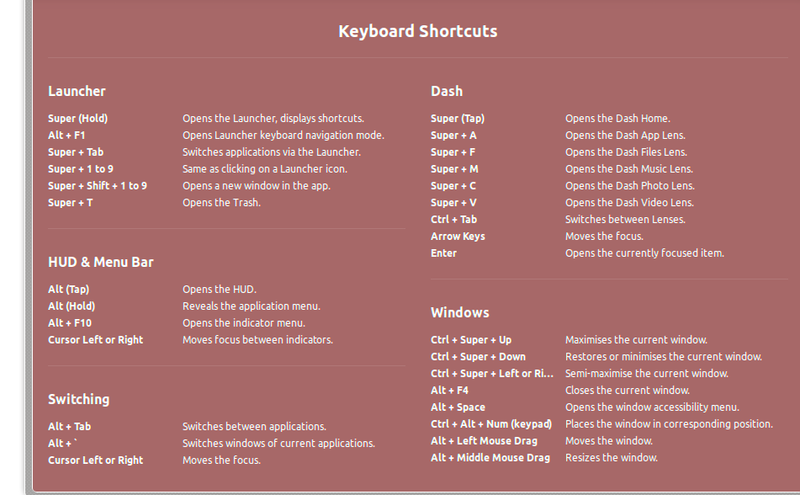 Can I get Unity-style Super+[1-9] keyboard shortcuts for launching apps in Gnome Shell? Can I create a launcher for keyboard shortcuts? With same keyboard shorcut, is it possible to make application one execute before global one?